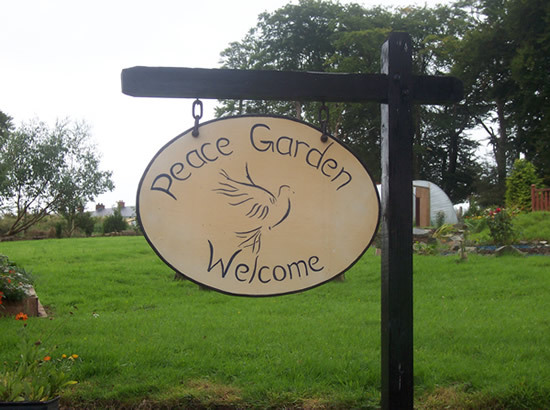 In 2005 a Peace Garden was opened in the grounds of Darkley House. Construction of which was a process of reconciliation, in that it involved cooperation between the staff and volunteers of Crossfire Trust, Darkley Club House, local villagers, the Conservation Volunteers, Barley Site Savers and Darkley Primary School. Advice on the garden concept was approved by a number of local people whose lives were affected by the troubles. The garden encompassed two large areas of planted shrubbery, one in the shape of Ireland, the other in the shape of England, Scotland and Wales. Both were planted with symbolic plants and connected by a bridge. Enclosing the ‘islands’ were rocks, boulders, iron bars and gates, which were places of reflection for visitors. 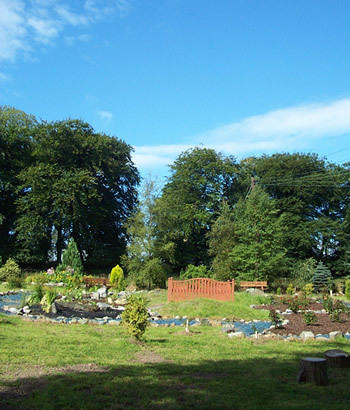 The concept of a peace garden was first muted during a reconciliation event in Darkley House, where people came together in an attempt to express their feelings, misgivings and the hurt they experienced as a result of the conflict, in an attempt to reconcile and move forward. Its strategic location on a hillside at Darkley village, an area that suffered much has helped to replace the negative images of conflict and turmoil with purpose and pleasure. The garden grew and blossomed as did the community conversations. We journeyed as a people beyond the initial mistrust to build and host diverse conversations and so the need of the Peace Garden gave way to a new purpose.